It is our greatest privilege to give back to the Certified Hand Therapist (CHT) community through our participation in the American Society of Hand Therapists (ASHT) sponsored Hand Therapy Week (June 2015). 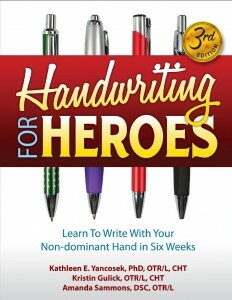 As part of this, LHP gave away 30 copies of Handwriting For Heroes to randomly chosen participants of HTW 2015. 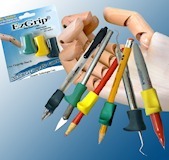 I received an unexpected gift for participating in Hand Therapy Week this year. Loving Healing Press, Inc. (www.lovinghealing.com) sent a copy of Handwriting for Heroes: Learn to Write with Your Non-Dominant Hand in Six Weeks. The book has been so much fun! It was a resource for my patients that I did not know was available. More importantly, I felt my participation in Hand Therapy Week was noticed and important, which inspires me to continue to contribute. I just bought your book in google play to use it with à patient. I can not print the work sheets as it is not à pdf book. How can I do it?